Rock falls 63 years apart in 1947 and 2010 strike the same 2010 maintenance building in Zion National Park in almost the same spot. Photos courtesy of the National Park Service. 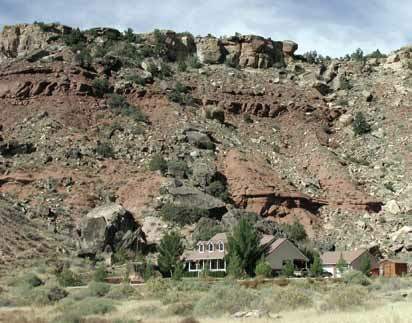 Southwestern Utah’s combination of steep slopes capped by resistant cliffs and ledges of bedrock makes rock fall the region’s most common form of slope failure. Rock fall is the dislodging and rapid downslope movement of rocks and small rock masses; rock fall is a safety hazard because falling or rolling rocks can damage property and cause injury or even loss of life. 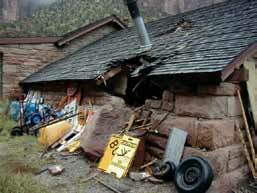 In recent years as development in southwestern Utah has encroached into rock-fall hazard areas, rock-fall strikes have become increasingly common, damaging property in St. George, Rockville, and Zion National Park, crushing a water pipeline in Parowan Canyon, and closing State Route 14 in Cedar Canyon for almost two weeks. 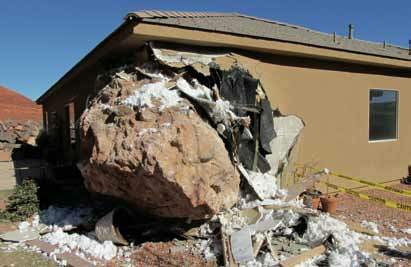 Additionally, a rock fall in January 2013 seriously injured the occupant of a home in St. George. Rock falls occur where a source of rock exists above slopes steep enough to allow rapid downslope movement of rocks by falling, rolling, and bouncing. Gravity is the ultimate cause of rock falls, and most rock falls occur with little or no warning. However, sometimes there is a discernible triggering event such as a rainstorm, freeze/thaw cycle, rapid snow melt, or erosion below a cliff or ledge. 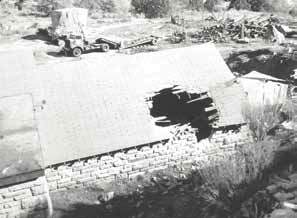 Earthquakes often cause rock falls, and the 1992 magnitude 5.8 St. George earthquake resulted in numerous rock falls in southwestern Utah. Additionally, slope modifications such as road cuts, building pads, or clearing slope vegetation for development, can heighten or create local rock-fall hazards. Early recognition and avoidance of rock-fall-prone areas is the most effective way to reduce rock-fall hazard and risk. Because rock falls typically occur repeatedly where conditions for them are most favorable, southwestern Utah residents can often identify rock-fall hazard areas by the accumulation of rock-fall boulders on and at the base of susceptible slopes. The presence of these boulder accumulations is evidence of a rock-fall hazard, and provides a clear warning that rock-fall-mitigation measures are required if development is to take place in those areas. When avoidance is not an option, numerous techniques are available to reduce potential rock-fall damage. For more than a decade, geologists in the Utah Geological Survey’s (UGS) Southern Regional Office have been mapping rock-fall and other geologic hazards in southwestern Utah. 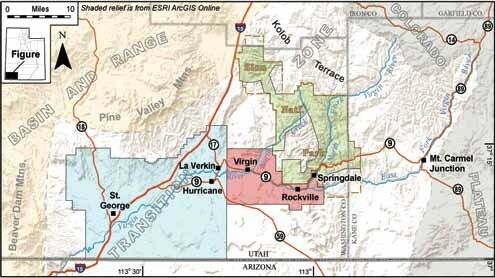 Geographic-information-system-based hazard map folios are now available for the 366-square-mile St. George–Hurricane metropolitan area, and the 154-square-mile highest visitation portion of Zion National Park. Additionally, the UGS will soon release a hazard map folio for the 97-square-mile State Route 9 scenic corridor between the communities of La Verkin and Springdale. The UGS provides copies of its hazard maps to communities within the study areas, so planners and public officials have accurate, easily available information on rock-fall and other hazards in their jurisdictions as they plan for and manage future growth. The St. George and Zion National Park hazard maps are also available to the public on the UGS website at http://geology.utah.gov/maps/geohazmap/washington.htm. The State Route 9 maps will be placed on the website when the report is published. In addition to showing where rock-fall hazards may occur, the maps include recommendations for conducting investigations to reduce risk to property and life safety. In some instances, a site-specific assessment may only require a field geologic evaluation to determine if a rock fall source is present. If a source is identified, additional work is required to assess the hazard. Parameters that must be evaluated include rock type, joints and other fractures, bedding planes, and potential maximum rock size. Slopes below a source should be evaluated for slope angle, aspect, surface roughness, vegetation, and distribution and size of past rockfall boulders. Additionally, the distance to which rocks may run out beyond the base of the slope requires careful evaluation. Once a rock-fall hazard has been identified and characterized, a geotechnical consultant experienced in rock-fall-hazard mitigation should provide design or site-preparation recommendations to reduce the hazard. The map recommendations have a particular urgency because all recent damaging rock falls in the three UGS study areas have occurred in locations mapped as having a high rock-fall hazard, but where mitigation measures were not implemented. 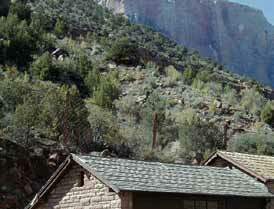 In summary, rock falls happen on a daily basis somewhere in southwestern Utah, and while the majority occur in remote areas or cause no damage or injury, damaging and life-threatening rock-fall strikes are becoming more common as development continues to move into areas subject to rock-fall hazard. The next damaging rock fall in southwestern Utah is simply a matter of time, and if the recent past is the key to the future, it won’t be a very long time. That is why the UGS continues to actively map rock-fall and other geologic hazards in southwestern Utah, and to work with communities and the public to reduce rock-fall hazard and risk. Energy News: Are Ownership and Production Patterns of Utah Petroleum Resources Related? 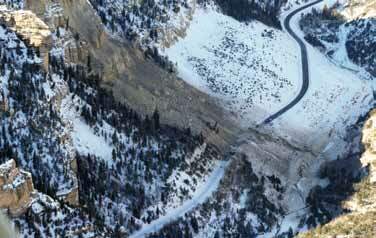 Glad You Asked: Where is the Coolest Spot in Utah?